If you have a student loan cosigner, there are a few benefits. First, you will likely be able to qualify for a higher loan amount than if you applied on your own. If you got denied for a specific amount on your own, having a cosigner will increase the likelihood for approval. Having a cosigner will help you build your own credit. Let's take a closer look at the benefits of having a student loan cosigner. With a cosigner, there is an increased chance of loan approval. Typically, a cosigner will have good, if not excellent, credit. Since a lender will see this and know the cosigner is equally responsible for the debt, they will likely approve the loan amount. With an additional person responsible for the debt, there is less risk to the lender. When the other person taking responsibility for the debt has a proven track record for paying their debt, it is a good sign to the bank. With a cosigner on the loan, there is more income available to approve the loan with. The applicant's and cosigner's incomes will be combined, so if a student needs a high loan amount, a cosigner is a good thing to have. This is not a guarantee, however. Just because you have a cosigner does not mean you will be able to get a higher amount. That will depend on the cosigner's income, credit score, and debt-to-income ratio. Once your name is on the loan, with or without a cosigner, you are responsible for the debt, and its prompt repayment. Making payments on time will help build your credit, and help the cosigner's credit, too. 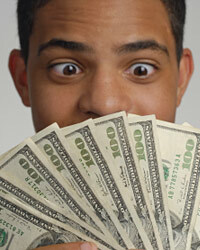 Conversely, if you do not make payments on time, the cosigner will need to, or both credit scores will suffer. If you don't make the payments, you could harm your relationship with the cosigner. This could create future issues if you ever need help establishing credit again. Getting a student loan cosigner probably won't be the easiest thing you've ever done because it's not something you should ask just anyone you know. Ask only close relatives or financially stable friends you don't mind sharing your personal financial information with. Be prepared to show how you intend to pay the loan back and show exactly why you need the loan and where the funds will go. Treating it as a professional business partnership will show the person you are asking to cosign for you that you are taking it seriously, which will give him or her faith that you will meet your obligations. Before you get a cosigner, though, try to get approved for the loan on your own because there may be other instances when you need a cosigner and may not have one available.